The MFC-8220 is a 5-in-1 Laser Multi-Function Center® machine that truly outperforms any other laser sheetfed all-in-one product in its class! 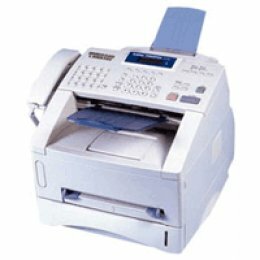 The MFC-8220 is not only a laser printer and a feature-rich standalone fax, but also a full function copier and B/W scanner. Also included is PC Fax capability, allowing you to send and receive faxes1 via your desktop PC. In addition to producing sharp, laser print quality of up to 2400 x 600 dpi (HQ1200), the MFC-8220 prints and copies at an impressive speed of up to 21 ppm/cpm. The MFC-8220 comes equipped with a 250-sheet adjustable paper tray for letter or legal size paper and an optional second 250-sheet paper tray is also available2. Both USB and parallel ports are standard3 and the MFC-8220 is compatible with Windows®, Mac® and DOS® Operating Systems. 2 Based on Brother # 1 Chart with MMR coding (Standard Resolution). 3 Check with local phone company for availability of these services. 5 300 x 600 dpi optical resolution. 6 Windows� XP resolutions up to 9600x9600dpi can be selected by using Brother Scanner Utility. 7 PC Fax Send only for Mac�.